You are here: Home / Blog / Public Lands Package Passes the House - Set to Become Law! The biggest public lands package in a decade passed the House of Representatives and is expected to be signed into law by the President soon. This is huge news for the wild places where we play! The package will conserve public lands and support outdoor recreation across the nation. 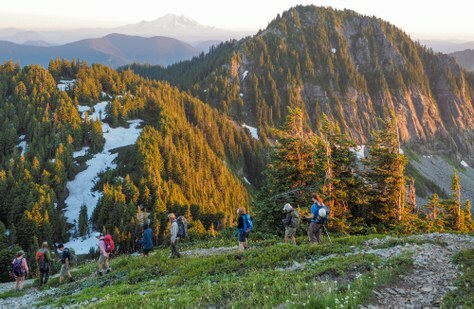 The bill contains measures The Mountaineers has championed for years, including the permanent reauthorization of the Land & Water Conservation Fund, the designation of the Mountain to Sound Greenway National Heritage Area, and the protection of Methow Valley. These days it’s pretty hard for lawmakers to agree, but the American people’s overwhelming support for public lands helped transcend party lines. The bill passed both the Senate and the House with sizeable majorities. This type of political action isn’t possible without citizens stepping up and making their voices heard. To the thousands of you who took action on these issues – thank you, thank you, thank you! Permanently reauthorize the Land & Water Conversation Fund. This critical nationwide conservation program has been in danger of expiring for years. Learn more. Establish the Mountains to Sound Greenway National Heritage Area. This designation would protect 1.5 million acres of public and private land from Seattle to Central Washington. Learn more. Protect the Methow Headwaters. This measure would safeguard one our state’s premier recreation areas from industrial-scale mining claims. Learn more. Our partner organizations across the country worked on many of the package's bills. You can check our collective efforts in this piece by Outdoor Alliance. We appreciate the full support of the ENTIRE Washington delegation for this bill. Thank you to all Washington members of the House of Representatives and both Senators voting for public lands! The President is expected sign the legislation soon, at which point it will become law. We’ll be sure to let you all know when things are officially in the books!